Part 1 about my basic approach to menu planning. Part 2 about maintaining a well-stocked pantry & kitchen. Pick one or two weekday breakfasts and have one of those two meals all week. Change up your breakfast plan each week so it doesn’t get boring. Do the same thing for snacks. Plan to eat out for lunch one day a week. Plan two dinners cooked from scratch each week that will each feed me at least 3-4 meals, and portion them out for individual leftover meals after cooking. Plan at least two dinners each week that are either a quick thrown-together meal from pantry staples, or dinner plans out. Select meals that have some cross-over ingredients in the same week. Now onto how I arrive at which meals get planned for each week. Step 1: Do a quick fridge/pantry check to see what perishable goods I have on hand that need using up. This week, I had some cauliflower and kale that needed eating quickly, so I am making kale/spinach/banana/peanut butter/almond milk smoothies with toast for breakfast, and one of my weeknight meals is cauliflower curry. Step 2: Consider what I’m craving along with any current dietary needs. Right now? I’m doing my best to eat fairly clean, so I need lots of fruits and veggies, but I’ve been craving comfort. That’s a tall order to combine comfort with clean eating, but roasting veggies does it for me every time… they just seem so much heartier and tastier to me when cooked that way! So I’ve also made polenta with sausage and roasted peppers & asparagus. Step 3: Consult my recipe folder and my Pinterest recipe boards for inspiration. I use Pinterest with abandon to save any recipes from food blogs that I want to try. 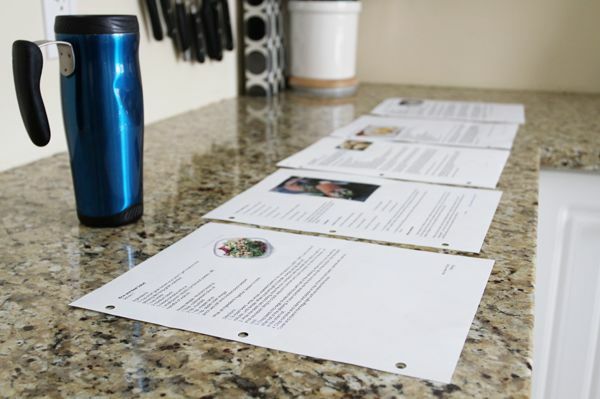 When I happen upon a winner, I print it out and keep it in my recipe folder, and also sometimes make notes on the Pinterest pin if there’s anything I want to remember for next time I make it. I delete any recipe pins that turn out to be duds, so my Pinterest boards are exclusively a source of stuff I like or stuff I really want to try. No bad recipes stay there. Step 4: Can you use the same ingredients in two meals, so you won’t be left with fresh produce going to waste? A few ideas: I make kale chips or use kale in a soup or stew the same week that I make kale smoothies for breakfast. If I had sausage with polenta for dinner for a couple of nights, I might have a sausage with breakfast for a couple of days that week also. (Not on the same days!) Using half a pepper in your spaghetti sauce? Chop up the other half and fry it up with eggs for breakfast. Or as an alternative to using up leftover produce in another meal, I just buy/make hummus or some other dip and use the leftover fresh veggies with dip as a snack. Step 5: Now that you’ve got your main meals sorted out, plan your snacks. I have a steady rotation of snacks I use, but I choose them based on what my meals are those days. I’m not going to have a granola bar for a mid-morning snack the same day I had toast for breakfast; I’m more likely to pick fruit or yogurt for nutritional variety. Bonus, a couple of sample weekly menus for you! Dinner 3: Creamy Chicken Stew (via Framed Cooks). Breakfast all week: Homemade breakfast sandwiches – Fried egg, cheddar cheese, bacon, sliced tomato & spinach on a toasted English muffin. Snacks: Apple & cheese, or a banana. I love this sample menu because there’s great variety in the type of meal I’m eating, but also a lot of cross-ingredient usage across meals. Swiss chard is used in the minestrone as well as sauteed chard. Chicken is used for grilling in Dinner 2 as well as in the chicken stew, so I’d only have to buy one package of chicken for the week. A lot of the veggies in the minestrone can also be used in the chicken stew. The spinach from dinner 2 is also on the breakfast sandwiches, as is the bacon from the chicken stew. This would be pretty cheap to buy ingredients for a full week of cooking! Dinner 1: Spaghetti meat sauce served over spaghetti squash. Secret family recipe, no link! But this is a veggie-loaded sauce with a ground beef base. Dinner 2: Seared salmon with veggies over coconut noodles (via Bev Cooks). Same concept here – some overlap between ingredients, and variety in the menu at the same time. Asparagus & mushrooms are used in Dinner 2 as well as breakfast; peppers from the spaghetti are used in breakfast. Spaghetti sauce is great because it freezes well and can be served over spaghetti squash or real noodles. And I threw in a treat this week because the rest of the meals are pretty darn healthy! This entry was posted in Food, Systems, Wellness and tagged food preparation, grocery shopping, menu planning on April 30, 2013 by A Little Coffee.